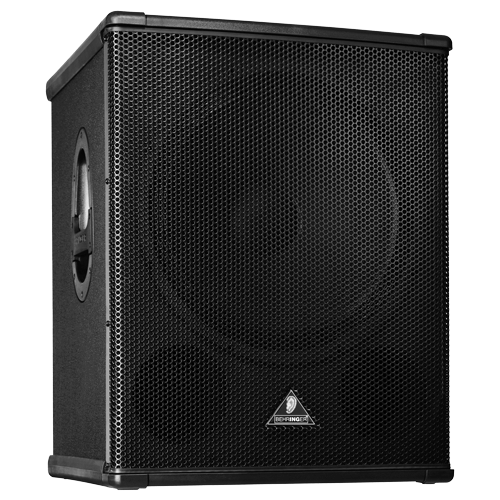 Professional 1,800-Watt 18" PA Subwoofer. The EUROLIVE B1800X PRO subwoofer is exactly what you've come to expect from BEHRINGER – 1,800-Watt power handling capacity, more features and absolutely more affordable! And thanks to the extremely powerful, long-excursion 18" Low-Frequency (LF) driver in a tuned enclosure, the B1800X PRO provides rich, tight bass all the way down to 40 Hz – enough to shake the house right down to its foundation. The B1800X PRO is destined to become a legend in its own right, alongside the other EUROLIVE models that have made BEHRINGER the world leader in subwoofers and loudspeakers.